It is only by the grace of God and the generosity of hundreds of supporters that we have been able to produce the first three albums of Psalms 1-30. We’ve still got a long way to go. If you want to see our work continue, please consider becoming one of our financial supporters today! Or signup to receive updates on new albums and tours. 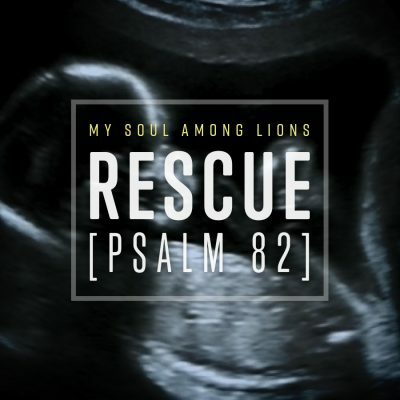 Oh, and did we mention a free download of our song Rescue (Psalm 82)? If you have never heard or heard of “My Soul Among Lions” I challenge you to check them out. They are extremely talented, but that is of least import here. The most important thing here is that they are biblical. They are singing God’s Words. While I truly encourage everyone to listen, I will warn you as well-if you are not interested in solid theology that brings maximum glory to our absolutely sovereign God, do not listen to them. If you are happy with “your God” then this is not for you. If you would like to know more about the true God-the God of the Bible-this music will help you learn more about Him. A fitting prayer for today. May God rescue the weak and needy and deliver them out of the hand of the wicked. Latest Psalm from MSAL. Give it a listen. Give it a sing. I said, "I will confess to you"
Check out our latest Psalm setting! To support us in our work and to get digital downloads as soon as they are released go to patreon.com/msal. Joshua Huizing and Hannah Faye cover our new Song of Moses. Sounds great, you two! Getting ready to introduce "Song of Moses (Exodus 15)" by My Soul Among Lions in the worship service at Grace Presbyterian Church tomorrow! Still in sleep stuff. It started when we were young, learning to sing in church and to play piano and violin and drums. But it really started several years ago when God brought us together from across the country to a church in the crossroads of America. We started as church musicians, doing our best to figure out how to help God’s people in worship, week in and week out. We joined the hymn revitalization movement and we wrote some new songs of our own. And then we discovered the tradition of psalm singing. The more we read and the more we worked, the more convinced we became that our church, and churches across the country, should be singing the psalms. So what was stopping them? The answer was easy—nobody had done the work of putting the Psalms to modern music. Sure, some people had done some Psalms and done them well. But nobody had tackled the whole book. It was a big job—big enough to take a lifetime. But somebody had to start somewhere, and, like the Good Book says, with God all things are possible. The other big question was what kind of music and forms to set God’s work to. It had to be complex and beautiful enough to capture the nuance of the text, and simple enough for grandpa and grandma and all the kiddos to sing along. We didn’t have to answer that question ourselves. Generations of gospel singers on the southern plains and Appalachian mountain men and street corner balladeers had answered it already. American folk music has evolved over the past two hundred years to express the simplest declarations of love, and the thorniest statements of political protest. It’s the music of children and the music of poets and philosophers. It’s the perfect music to capture the brightest bursts of color and the smallest shades of God’s truth. So we decided to form a proper band. We tuned our guitars, sharpened our pencils, and went to work. We tried the songs out on each other, on church congregations, and house parties, and anybody else who would listen. God blessed us and gave us some good tunes, and we hope and pray He will bless us still. Because the work is just beginning. © 2017 My Soul Among Lions. All rights reserved. Joining our mailing list is the best way to receive the latest news and updates. It's also the only way you can get a copy of Rescue, our recording of Psalm 82. Thanks for subscribing. Check your email to finish the process & get your free download!